Meanwhile, TDs have been told a fresh election would cost some €40 million. PRESSURE’S GROWING ON the leaders of Fianna Fáil and Fine Gael to hold government-forming talks over the weekend, following the conclusion of today’s round of discussions between Enda Kenny’s party and groups of independents. Michael Fitzmaurice of the Independent Alliance said this evening that the “pussyfooting needs to finish” and that the two largest parties should talk properly. Other independents observed that whatever arrangement can be made with non-party TDs in the vote for Taoiseach next Wednesday, if either party manages to form a minority government it will need the support of the other for each Dáil vote. Fianna Fáil and Fine Gael need to “get on with it and not be like children and grow up,” Fitzmaurice said. This is about forming a government. We have acted responsible, now its time for the parties to be responsible and talk to each other. Following the conclusion of Fine Gael’s talks with independent TDs this evening, Kenny said his party would now work towards developing a “foundation document for a partnership government”. Kenny said the talks with independents had covered a range of areas and that a number of priorities had been identified and discussed at length. Papers were being drafted and would continue to be worked upon over the weekend, he said. Independent TDs are due to hold talks with Fianna Fáil about the formation of a minority government with Micheál Martin’s party on Monday and Tuesday. But Kenny said Fine Gael would resume “our conversation and engagement” with independents on those days also. Kenny said that talks with Fianna Fáil would not begin until Wednesday, after the Dáil attempts to vote for a Taoiseach. The Fine Gael leader said he found “a sense of liberty” from the election result which meant that there would be “a very changed attitude from government” in the way it goes about its business. It’s never going to be the same again, the people have given an unprecedented spectrum in the way they’ve voted. I actually see an opportunity here for a real sense of openness and thoroughness and completeness about politics and the way it’s conducted. 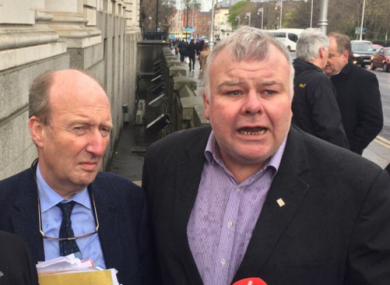 Roscommon TD Denis Naughten, who has taken a leading role in the talks, stated that Kenny and Martin now needed to meet as a matter of urgency. There would be no talks with independents led by either party over the next 48 hours, Naughten said, adding that the weekend provided an “ideal opportunity” for the two to talk to each other. Independent TDs emerging from talks this evening said they would not be rushed into deciding whether to back Fine Gael and Enda Kenny in next Wednesday’s Dáil vote to elect a Taoiseach. Earlier they were told that a second general election this year would cost the taxpayer at least €40 million. The warning came during the course of a briefing being given by Finance Minister Michael Noonan and his officials at Government Buildings today. Talks between the independents and Fine Gael had been due to conclude at lunchtime but a discussion on housing ran later than expected which meant the economic briefing from Noonan and his officials did not begin until after 12.30pm. It was during the course of that briefing that Independent Alliance TD Finian McGrath said he asked officials how much a second election would cost. The €40 million is not unusual for a general election, but it would come on top of the expenses occurring from the February election. It means the taxpayer would effectively have to meet the €80 million cost of two elections this year because of the failure to form a government following February’s vote. Speaking to TheJournal.ie earlier, McGrath said that those parties not involved in talks to form a government should be given a strong message about the cost of another election. Those TDs who are at home watching Sky Sports and Judge Judy could end up costing the taxpayer €40 million. The same economic briefing also heard that the next government would have around €500 million in extra spending power in the next Budget. This would double to €1 billion in the following Budget, according to the latest economic growth projections. Kerry independent TD Michael Healy-Rae said Michael Noonan had “outlined the financial situation as he sees it in a very frank and honest and meaningful way,” and that he had learned a lot about the current state of the nation from the week’s talks. He had raised issues of concern to himself and to his constituents, he said – highlighting the closure of rural post offices as a particular priority issue. The cost of running an election is met by the Department of Finance from the central exchequer fund and is based on a charges order made by the Public Expenditure and Reform Minister. A significant amount of the €40 million would go towards paying for the distribution of polling cards and election literature to voters. By law, every candidate is entitled to a Litir um Thoghchan, which is one leaflet delivered to every registered voter in their constituency. There are also costs like the reimbursement of election expenses which a candidate is entitled to if they receive a quarter of the quota of votes for their constituency. Other costs would include staffing at polling stations and count centres. The 2011 general election cost €29 million, according to the Department of Public Expenditure and Reform. Email “Enda and Micheál need to stop "pussyfooting" and talk properly - Fitzmaurice”. Feedback on “Enda and Micheál need to stop "pussyfooting" and talk properly - Fitzmaurice”.